Stories of the Curse of Tutankhamun still circulate today. Myths and legends about deaths, curses and mummies are both fun and frightening. The idea of the curse is kept alive by our imaginations and constant reminders of the curse by various movies. 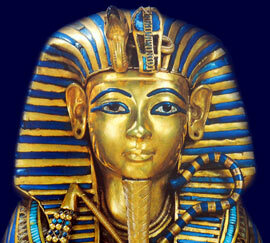 We are fascinated by the boy-king who was buried with his fabulous treasures for nearly 3500 years. There is part of us that perhaps believe that it was wrong to disturb his secret, sacred burial place. And that the invocation of the 'Curse of Tutankhamun' was just retribution for the violators of his tomb. But what are the facts and what is fiction that surround the legends and myths of the Curse of Tutankhamun? I am for the protection of the Osiris. This is to repel the enemy of Osiris, in whatever form he may come." "Anyone who disturbs the tomb of Tutankhamun will die a terrible death"
So we know that the press fuelled the idea of the Curse of Tutankhamun. But why? Was the Curse of Tutankhamun based on any facts? What are the facts and what is fiction that surround the legends and myths of the Curse of Tutankhamun? This section details the facts about the how the Curse of Tutankhamun grew. Comprehensive details of the occurrences can be accessed via the Curse of King Tut link. Fact 3 26 November 1922: Carter makes the famous "tiny breach in the top left hand corner" of the tomb doorway accompanied by Lord Carnarvon and his daughter Lady Evelyn Herbert. Fact 17 Newspapers blame the deaths of other people, associated with the opening of the tomb, on the Curse of King Tut. Fact 18 It was reported that "Several American politicians went so far as to call for an investigation of mummies to determine whether or not these possessed the same medical dangers as those thought to be apparent in the tomb." There was never just one specific Curse of King Tut. But the myths and legends are indeed based on some truth, facts and beliefs of the Ancient Egyptians. Each section of the Curse of Tutankhamun addresses all topics and provides interesting facts and information about the Golden Age of Pharaohs and of Egypt. The Sitemap provides full details of all of the information and facts provided about the fascinating subject of the Pharaoh - Tutankhamun and the Curse of Tutankhamun!